Execution -- getting things done -made easy and effective with simple, proven project management tools. Following on the huge success of the author's previous works, The One-Page Project Manager for Execution gives business leaders the means they seek for greater success. This helpful guide cuts through red tape and procedural hurdles to provide tools, templates, and teachings for rapid implementation by both the novice and seasoned practitioner. These methods communicate and align company strategy, as well as drive engagement and problem solving. Offers the latest refinement on Toyota management principles, A3 reports, Lean Processes, and strategy deployment. 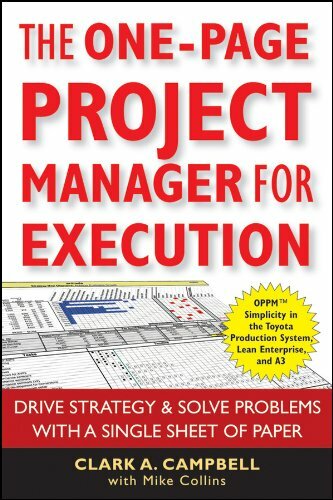 Easy to read, easy to implement, and a strong bridge to more advanced learning Invaluable as both a classroom text and an on-the-job resource, The One-Page Project Manager for Execution is a key guide for executives, business leaders, industrial and manufacturing engineers, project management professionals, academics, and students. Manage any IT project--on a single sheet of paper! In The One-Page Project Manager, Clark Campbell showed managers how to reduce any project--no matter how big or complicated--to a simple, one-page document perfect for expressing essential details, communicating those details to upper management, and tracking progress. Now, this uncommonly practical guide offers the same concise thinking and practical guidance to IT project managers. Fully adaptable to virtually any project in your organization, The One-Page Project Manager for IT Projects is the ultimate tool for overworked IT managers who understand the value of simplicity. "Provides a proven process for project management that significantly improves the chances that the project will be completed on time, on budget, and on target." "If you've ever needed to manage several projects at once, you know the dilemma: there has to be a better way to track the projects quickly, concisely, and reliably, but finding and learning that better way always seems too tedious, costly, or complicated. This book solves that problem."